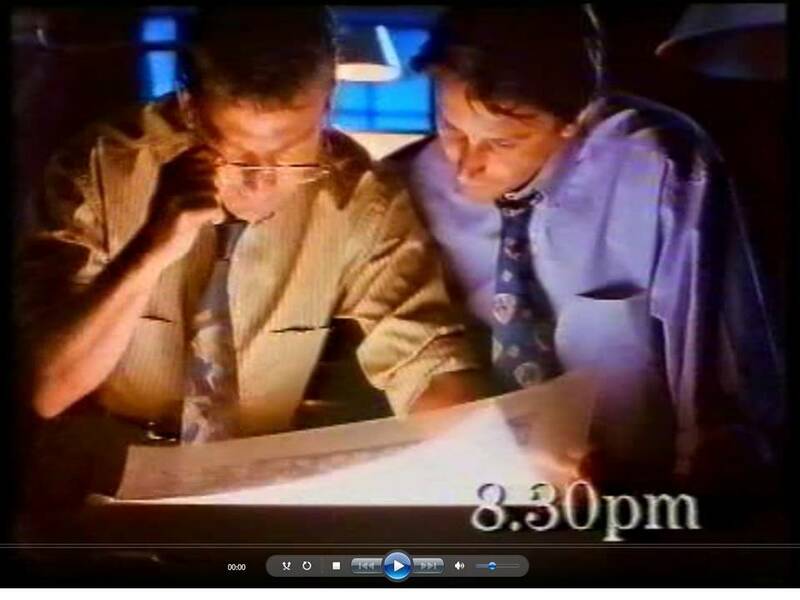 When looking back more than fifteen or twenty years, TV commercials also generally provide a glimpse of culture, fashions and trends of a different time. HP TV commercials of the 1980s provide all of these elements. HP started advertising on television in the Autumn of 1981 (Measure Mar-Apr 1982, page 13). HP produced five ads for its original TV push. 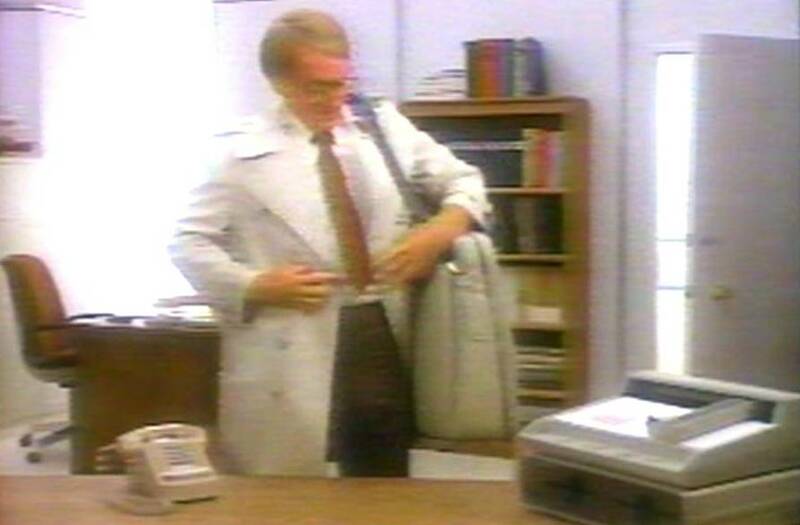 These ads were shown during college and professional football games beginning in September of 1981. Products featured included the 41, 85, 125 and HP graphics solutions. The museum has a collection of over fifty HP TV commercials from the 1980s and early 1990s. They provide a wonderful look at HP's approach to brand selling, category selling and product selling. 1981 – Management Performance Must Be Measured By Results. Selling business graphics and featuring 9872-class plotters. USA . 30 Sec. 1981 – Ginger Beer Factory. Improving Productivity with Computers. Features many products including: 9845C, 2645A, 85A, 2631A, 3000, 41C, 7225A, 9872, 2671A and 7920. Filmed in Melbourne. 60 sec. View 10 second clip (2 Mb). 1981 – HP 85 features and benefits. USA . 30 sec. 1981 – When Professional Performance Must Be Measured By Results. Features and portability of the HP-85. Also shows the 82901M disc drive and 7225A plotter. USA . 30 sec. 1981 – When Performance Must Be Measured By Results. Features the HP-125 personal office computer. Also shows the 82901M disc drive and 9872A plotter. USA . 30 sec. 1981 – When Performance Must Be Measured By Results. HP computer in hospital predicts heart attack before it happens. USA . 30 sec. 1983 – Personal Computation for Professionals. Introduces the HP-75 portable computer being used in a plane and taxi. Also shows: 9826, 9836, 86, 120, 9845, and 41. Australia . 30 sec. View 8 second clip (1.8 Mb). 1983 – Productivity for Industry, Business and Uncle Conrads Ledgers. Nephew visits the office. Features the 120. Australia . 30 sec. View 11 second clip (2.6 Mb). 1984 – See the Touchscreen Computer at Your Nearest HP Dealer. Uses of the HP 150. Shows a caterpillar climbing a stack of software. USA . 30 sec. 1984 – Hewlett Packard Personal Computers – Setting You Free. Introducing the HP 150. Shows a caterpillar climbing up a 150 and turning into a butterfly. USA . 30 sec. 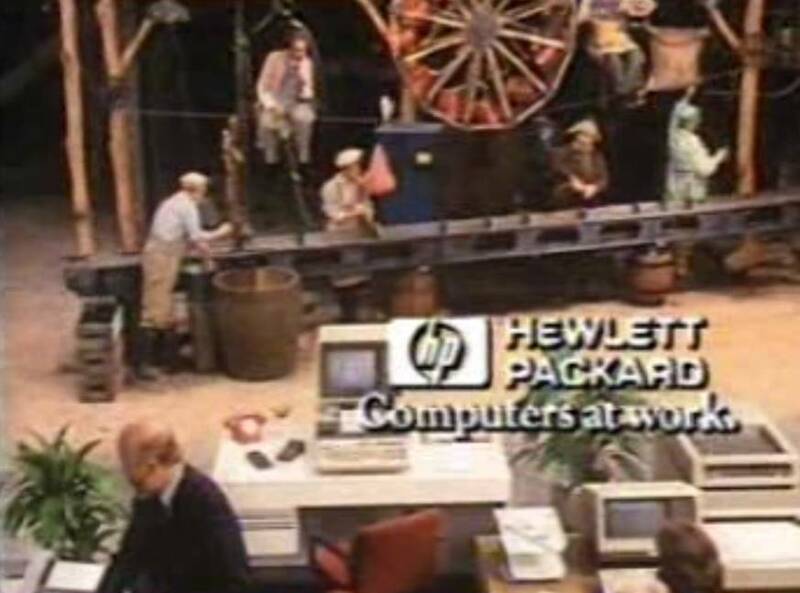 1984 – HP Personal Computers – Keeping Industry, Business and Uncle Conrad In Touch. Nephew comes to the office to see an HP 150. Australia . 30 sec. View 11 second clip (2.3 Mb). 1984 – The Portable, Setting You Free. Features the Portable with built in spreadsheet, word processing and more memory than desktops. USA . 30 sec. 1985 – The Portable, the Fully Functional Personal Computer That's Really Portable. Nephew visits the office and Uncle Conrad is on Holiday with his Portable. Australia . 30 sec. View 11 second clip (2 Mb). 1985 – Animated commercial featuring The Beatles “We Can Work It Out”. 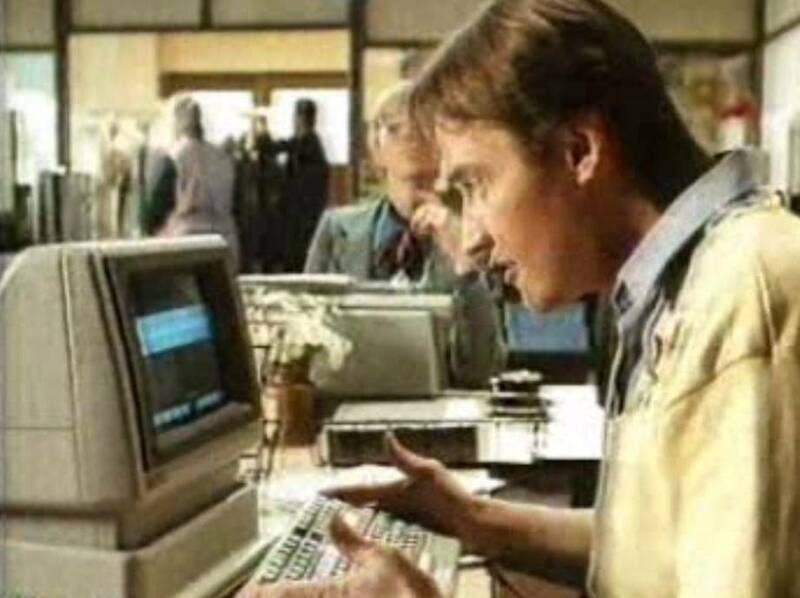 Hewlett-Packard – We Can Work It Out. UK . 60 sec. 1986 - "What If" ad featuring an HP sales rep jumping over a vacuum cleaner after thinking up the solution to a customer problem. A Touchscreen II is visible on the desk. USA. 30 sec. 1986 – We Can't Stay Modest Forever. Generic ad about personal computers and printers. Netherlands . 60 sec. 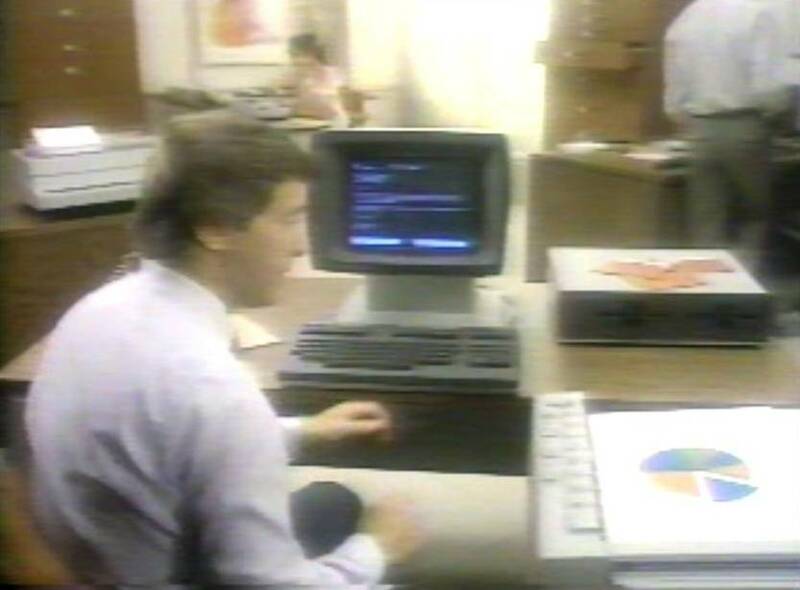 1986 - "What If" ad with a sales team pondering a customer problem with a backlog of data requests. A 12C calculator and Vectra running Lotus 1-2-3 graphics are visible. USA. 30s. 1986 - "What If" ad featuring man driving a sports car. USA. 30 sec. 1987 – “What If” ad featuring man driving a sports car. Australia . 30 sec. View 8 second clip (2 Mb). 1987 – Before We Ask “What If”, We Listen. Background products on display include Vectra, QuietJet Plus and 7475A. Australia . 30 sec. View 8 second clip (1.5 Mb). 1987 – “What If” ad featuring a man rowing on a river. USA . 30 sec. 1987 - "What If" ad featuring an HP sales rep pondering a customer problem while swimming laps in a pool. USA. 30 sec. 1989 – Great Lakes Fire Destruction. Hewlett-Packard: Engineered for Peace of Mind. Shows HP 3000 and 2392A terminal. Australia . 15 sec. View 10 second clip (1.5 Mb). 1989 – Hodge Podge Computer System. Features HP Vectra. There is a Better Way . USA . 30 sec. 1989 – Big computer box being opened. This Computer Has Open Systems – Hewlett Packard, Engineered For Peace of Mind. Shows the HP 3000 Series 950. Australia . 15 sec. View 6 second clip (1.2 Mb). 1989 – Kid in a computer store. There is a Better Way, Hewlett Packard. Features the HP Vectra. USA . 30 sec. 1989 – Interview with a manager. There Is a Better Way , Hewlett Packard. See Your Vectra Dealer. USA . 30 sec. 1989 – Man visits doctor. “That's your best reading for years”. Hewlett Packard, Engineered For Peace of Mind. Australia . 30 sec. View 10 second clip (1.7 Mb). 1989 – Man looking through magazine trying to decide on computer hardware. “Choose the brand that has them all.” Hewlett Packard, Engineered For Peace of Mind. Australia . 15 sec. View 7 second clip (1.2 Mb). 1989 – Sail making factory. HP Vectra computer. There is a Better Way , Hewlett Packard. USA . 30 sec. 1990 – Get extra memory when you buy a Vectra PC and LaserJet IIP free dual bin upgrade. Man comes out of a box. Australia. 30 sec. View 11 second clip (1.9 Mb). 1990 – It's not what you say, it's how you say it. LaserJet printers; they'll get you noticed. Dog ad. USA. 30 sec. 1991 – LaserJet printers. Keep those ideas coming. USA. 30 sec. 1991 – Get a free printer when you buy a Vectra PC. Shows PaintJet, Vectra RS, LaserJet III, and DeskJet 500. Australia . 15 sec. 1991 – Dreaming of a colour-capable, laser-Quality printer. DeskJet 500C. Australia . 15 sec. View 15 second clip (5.3 Mb). 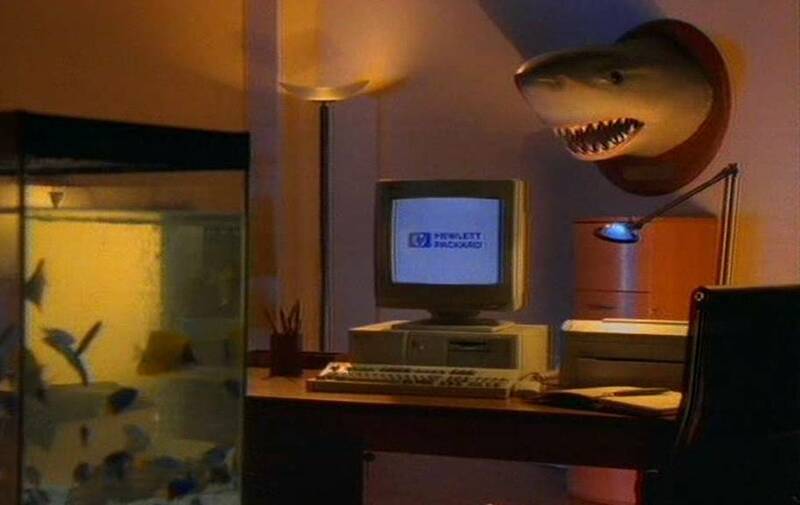 1991 – Hewlett-Packard - Quality PCs at affordable prices (Shark ad). Australia . 15 sec. View 15 second clip (2.3 Mb). 1991 – Dreaming of simple solutions for complex networks. Shows Vectra 386/25, 386N, LaserJet IIIsi, network-attach storage and AdvanceStack hubs. Australia . 15 sec. View 15 second clip (5.3 Mb). 1992 – LaserJet printers. Leap frog commercial. USA. 30 sec. 1992 – Save $780 on purchase of an HP printer and Lotus Freelance Graphics. Shows PaintJet XL, LaserJet IIISi, LaserJet III and 7550A plotter. Australia . 15 sec. 1992 – Barber shop scene talking about Bill and Dave going into business in 1939. Hewlett Packard, Showing the World the Way. New Zealand . 60 sec. View 18 second clip (6.5 Mb). 1992 – Modern day barber shop scene. Lighten up, it's only a bank manager. Displays HP leadership messages. New Zealand . 60 sec. View 15 second clip (5.4 Mb). 1992 – Meeting with the bank manager to get a new business loan. Showing the World the Way. Shows HP color printer output and a 95LX. New Zealand . 60 sec. View 17 second clip (5.9 Mb). 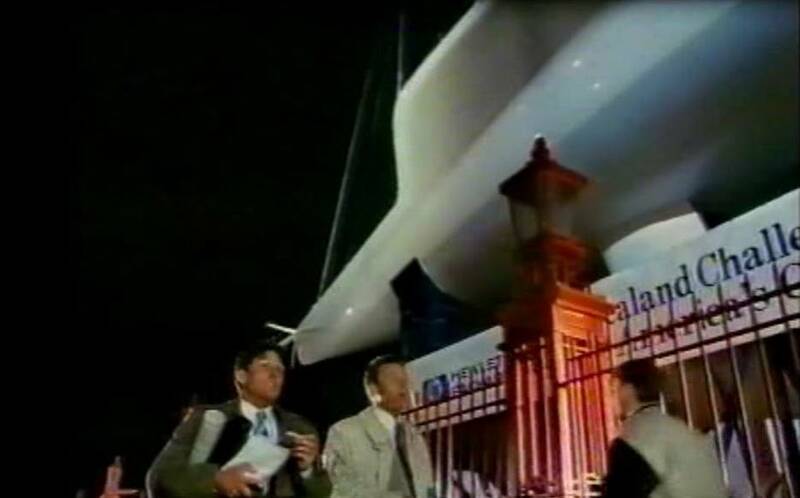 1992 – The Technology That Drives the 1992 Americas Cup. New Zealand . 30 sec. View 15 second clip (5.1 Mb). 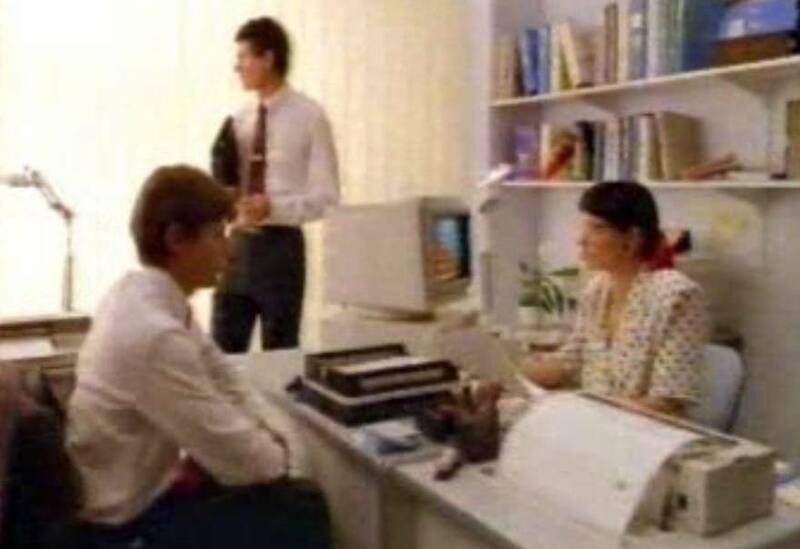 1992 – LaserJet 4 - a whole new standard in laser printing (champagne ad). Australia. 30 sec. View 15 second clip (4 Mb). 1992 – HP PCs, tops in all reliability studies; I'm sold. New Zealand . 15 sec. View 15 second clip (6.3 Mb). 1992 – Laser printers, Hewlett Packard outsells the lot. New Zealand . 15 sec. View 15 second clip (5.5 Mb). 1992 – Hewlett Packard DeskJet. The dot matrix is dead, long live the king. New Zealand . 15 sec. View 15 second clip (5.6 Mb). 1992 – Hewlett Packard networking, just plug and play. New Zealand . 15 sec. View 15 second clip (5.6 Mb). 1992 – The HP 95LX, the complete PC in the palm of your hand. New Zealand . 15 sec. View 15 second clip (5.3 Mb). 1992 – Hewlett Packard open systems workstations have the best price performance in the world. New Zealand . 15 sec. 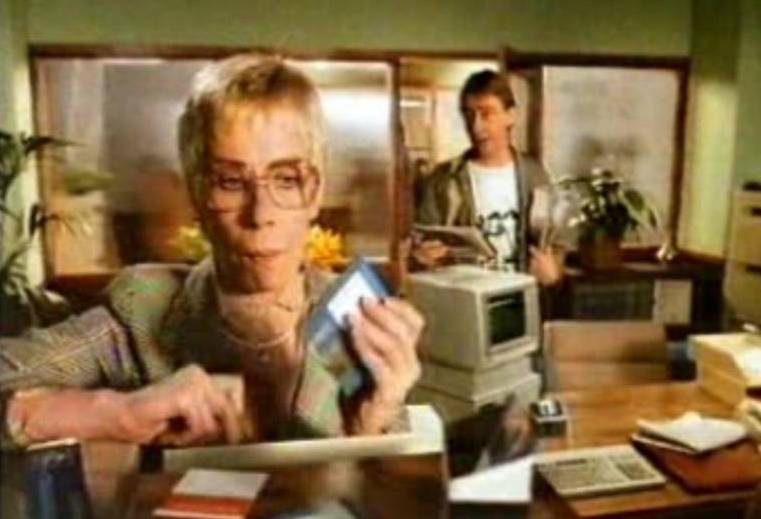 Clips from Australian TV commercials are shown with the permission of Hewlett Packard Australia Ltd.